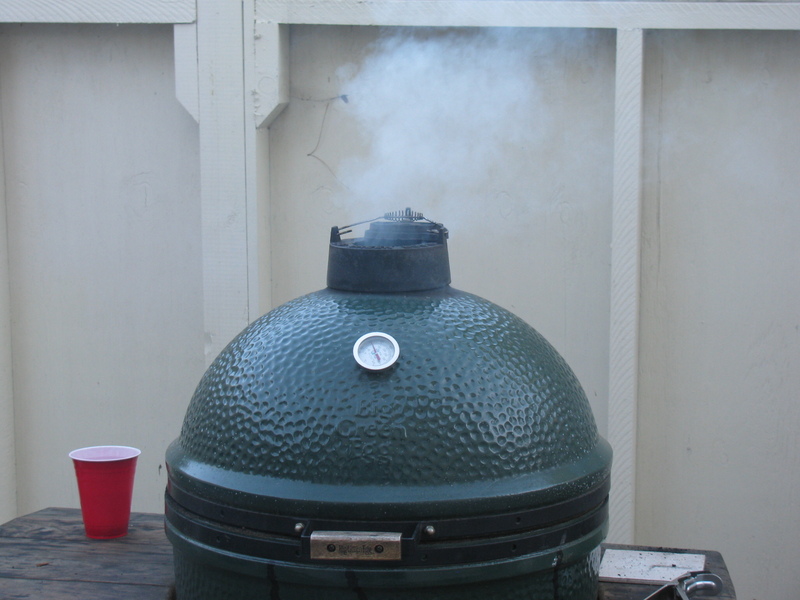 Getting the Big Green Egg up to temperature (250 degrees F). Hickory chips were added. 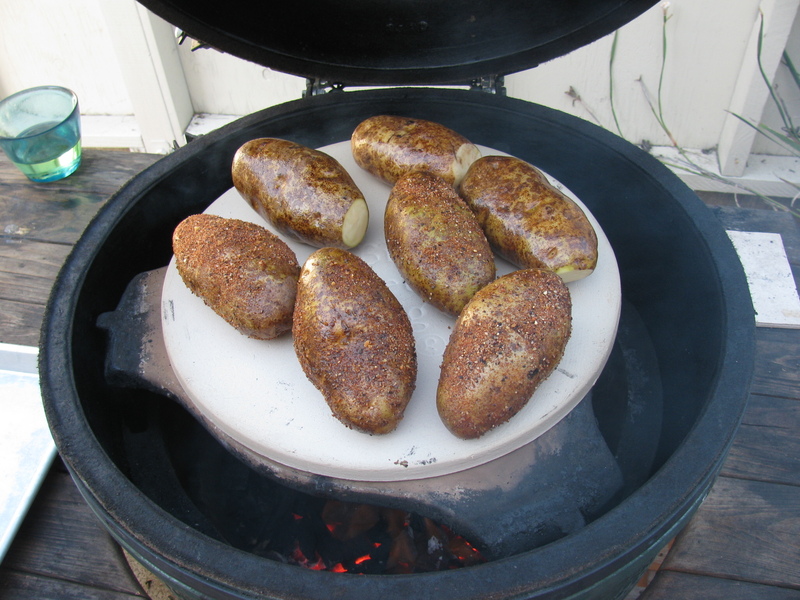 I wanted to try making baked potatoes on the BGE for over a year, and I finally tried it. This is based on the directions by The Naked Whiz, a ceramic cooker expert. 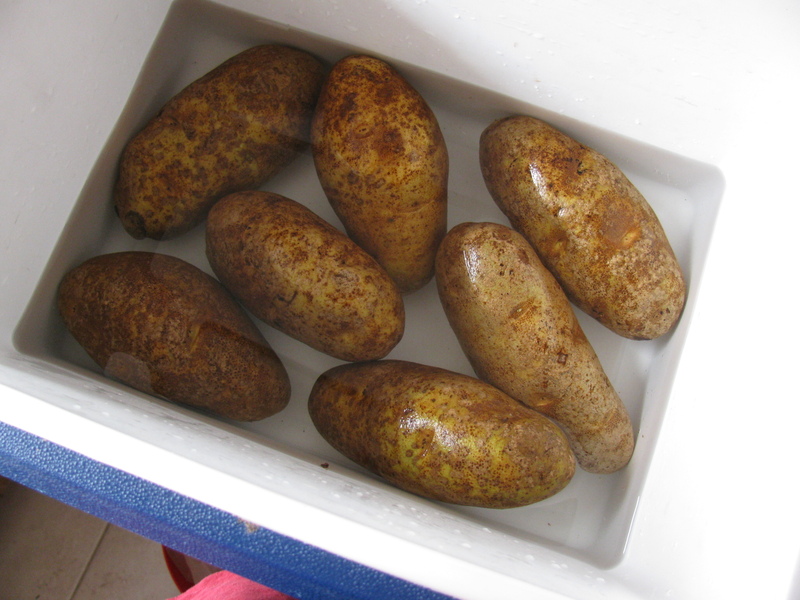 I cut the salt down to one-half cup and scrubbed the potatoes to make sure all traces of dirt were removed from the skin. 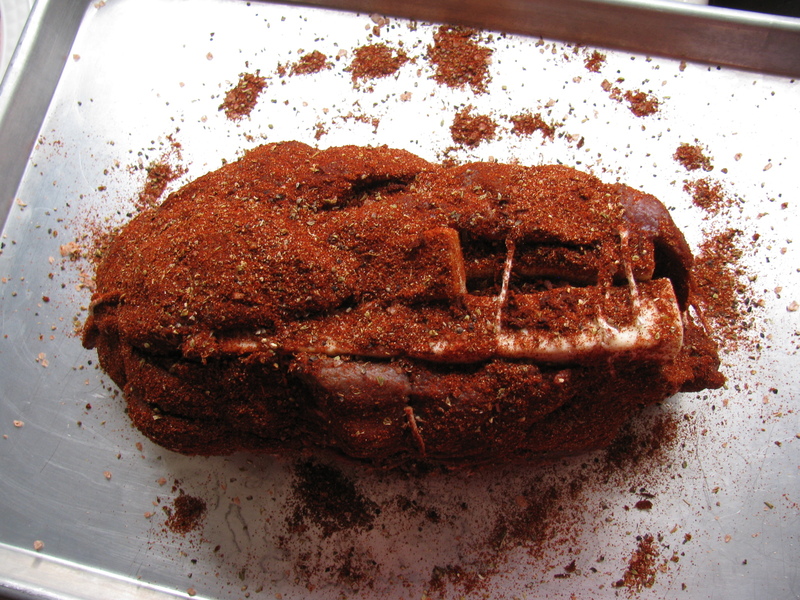 I used my own “universal rub” for meats instead of the Dizzy Pig rub. 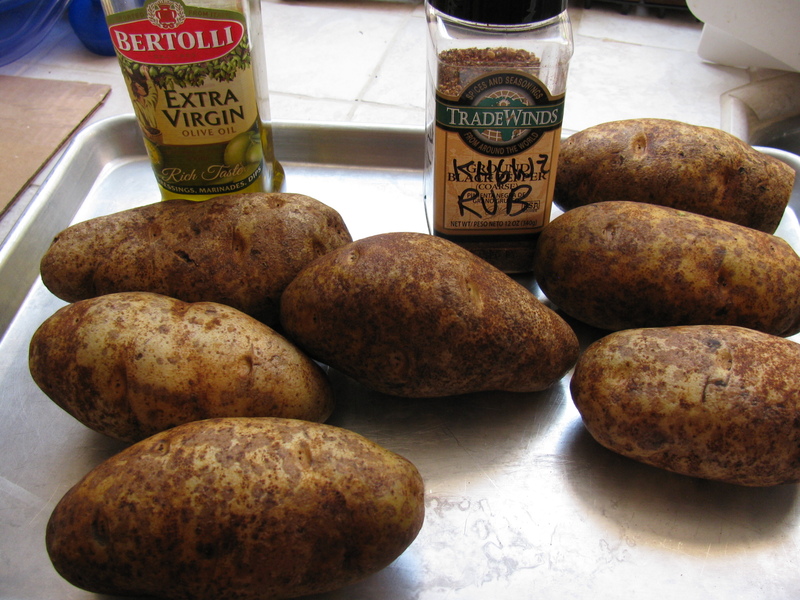 And this made me think about creating a rub for baked potatoes. 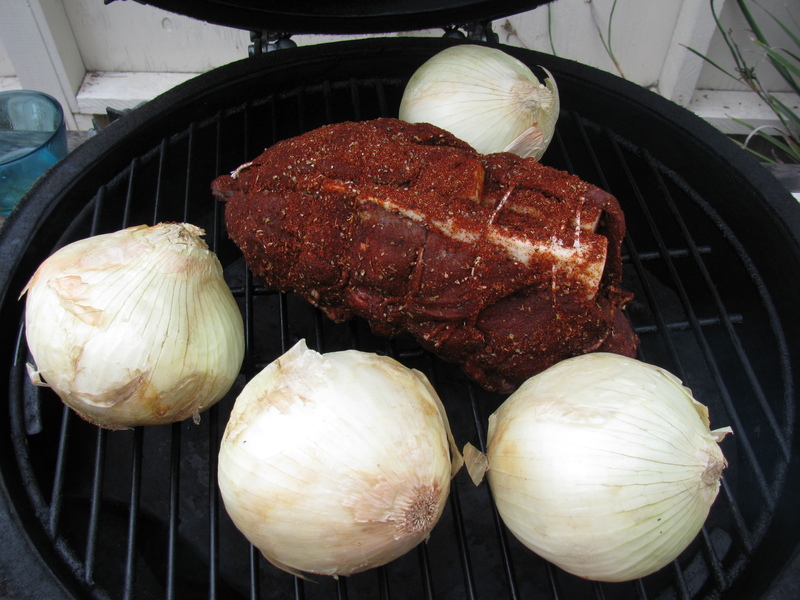 Something like onion and pepper and garlic – sounds almost like the rub I use for Santa Maria Style tri-tip. I cooked an entire 5 pound sack of russet potatoes for this trial. The original procedure said to turn the spuds half-way through the cooking time. I just let them bake on their own and did not turn them. 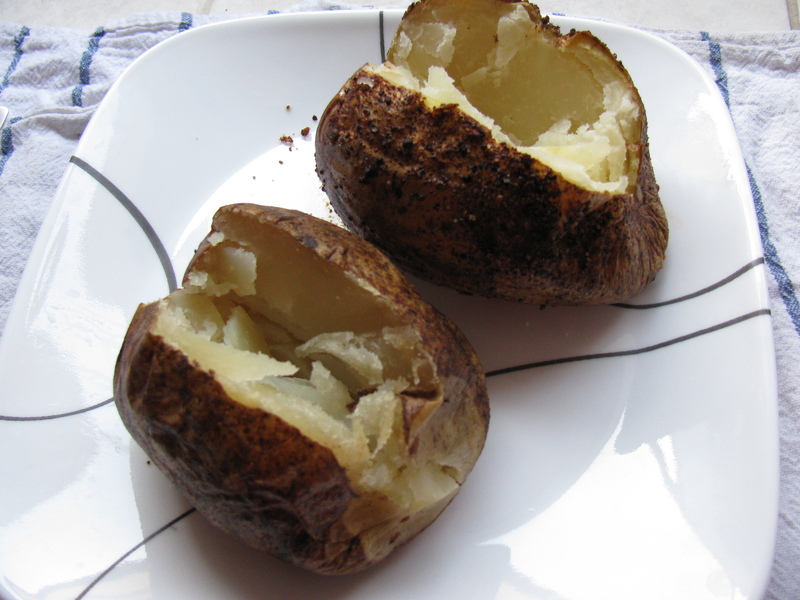 Naked Whiz says to bake the potatoes for one hour – My potatoes took one hour plus 10 minutes. 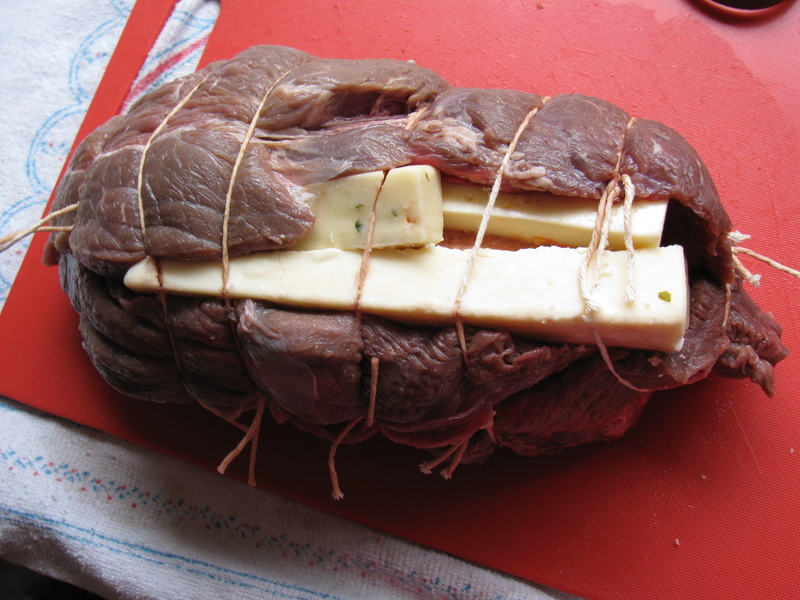 If you try this, test for doneness using a skewer – it should easily push into the potato. 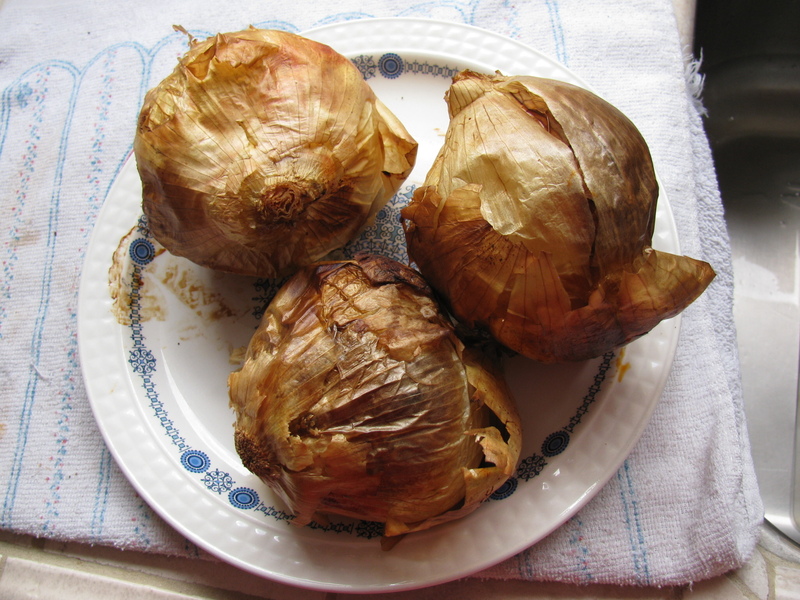 These were excellent – the texture is very good. 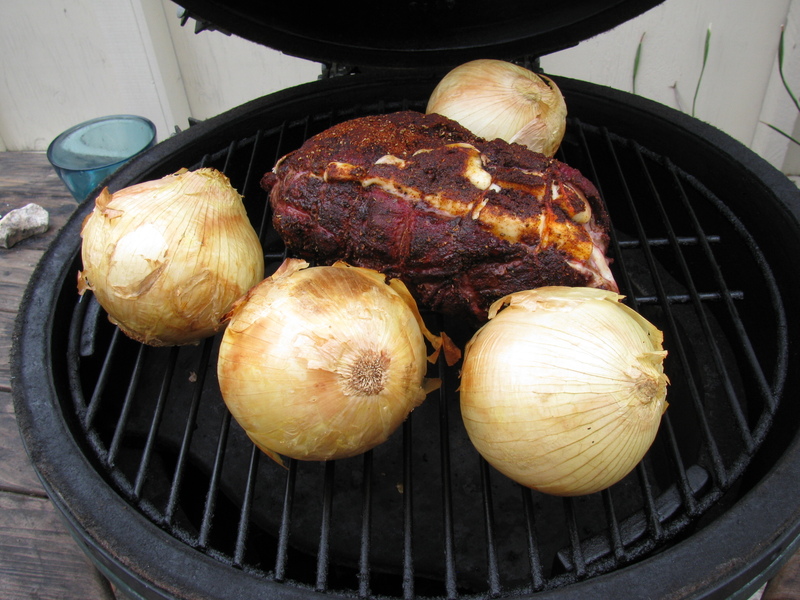 The skin has a smoky flavor, which could be another area to play with – add hickory chips next time? More baked potato experiments are in order. Here are some pictures. 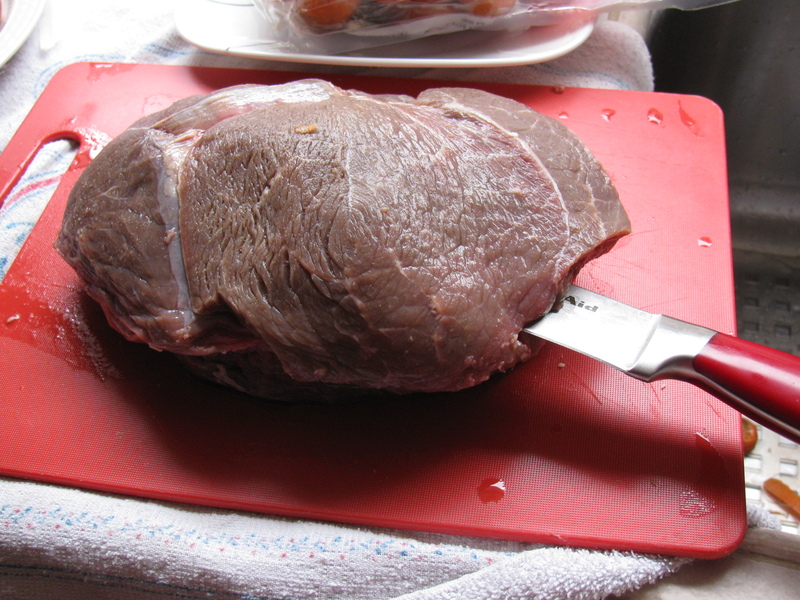 . .
It’s been a while since I made something special on the Big Green Egg, so I decided to take out a four-pound rib roast taking up space in my freezer. 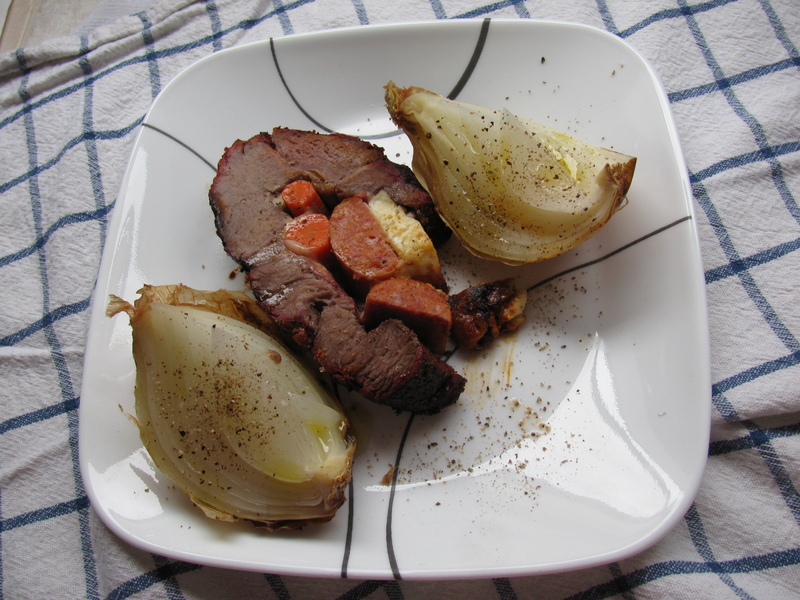 This recipe is from Steven Raichlen’s Primal Grill, Season 2, and originally uses the rotisserie on a gas grill. 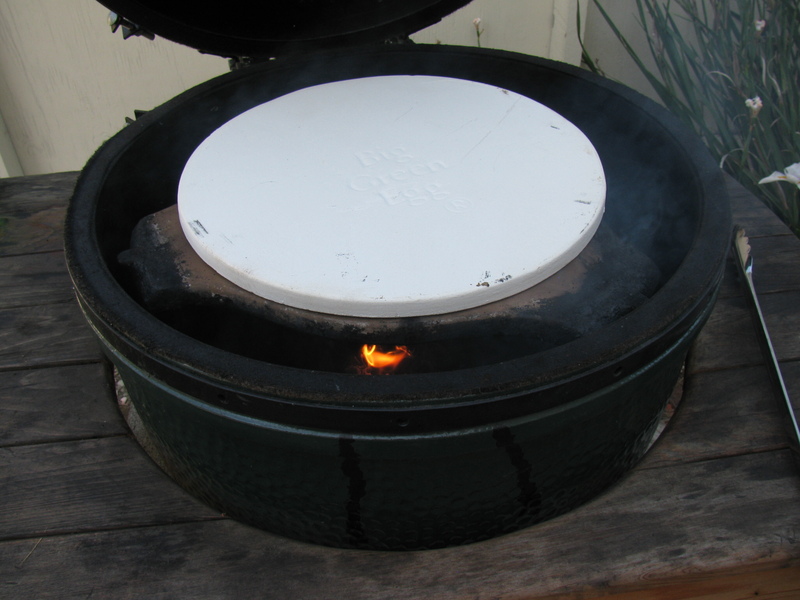 However, since the Big Green Egg does not need (nor can it fit) a rotisserie, I used the indirect method, using the Platesetter. 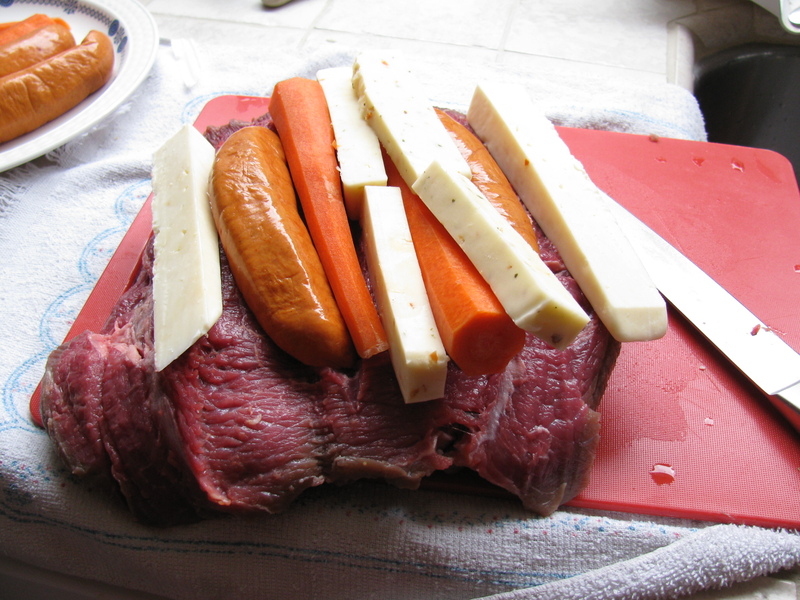 I substituted the romano cheese with some habanero jack cheese, since it was on sale, and I thought some hotness would taste good with the beef. For the sausage, I used some Louisana hot links, the same sausages I use when I make matambre. 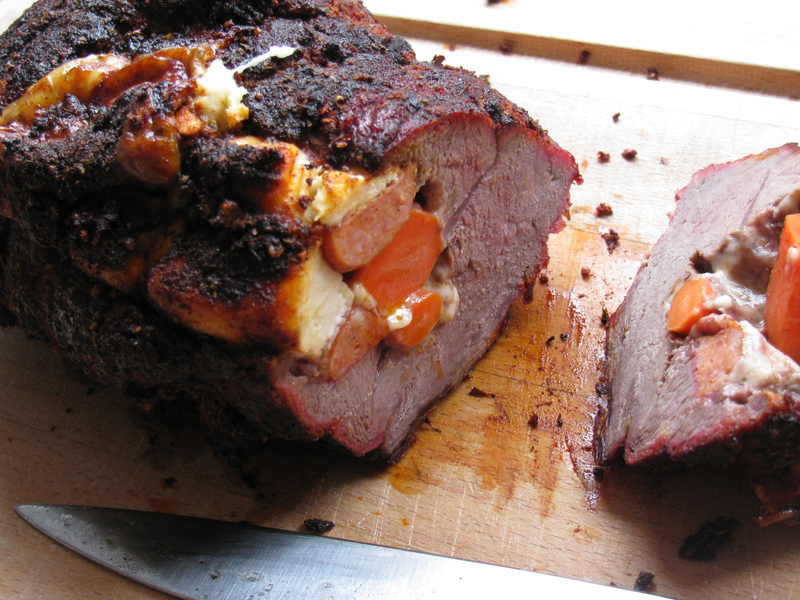 In Raichlen’s version, you poke a knife through the roast, then stuff the stuffing items in. After almost poking my hand with the knife, I decided to butterfly cut the roast, add the stuffing, and roll it, just like a matambre. Much easier. Here is a link to Raichlen’s version – click here. Here are some pictures for your enjoyment. . . .